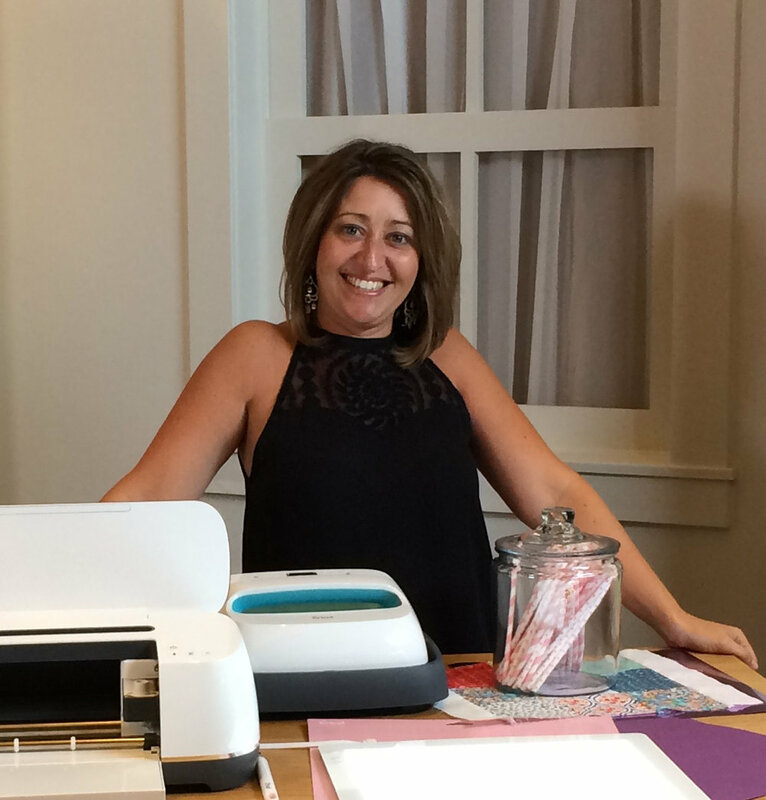 Thanks to Oriental Trading Company for providing me with fabulous products for this post. All ideas and opinions found in this post are my own. Affiliate links are included in this post, which means if you make a purchase using one of the links, I will earn a small commission, which helps keep my website running. To kick off the festivities I designed a merry and bright Ornament Decorating Party Invitation (available in the shop here). I mean seriously, y'all. Can you even handle it? SO darn adorable!!! For party decor, I hit up my go-to party supplier, Oriental Trading, and man, did I score! Not only did they have just what I was looking for, it's sooooo reasonably priced...major bonus during the expensive holiday season! 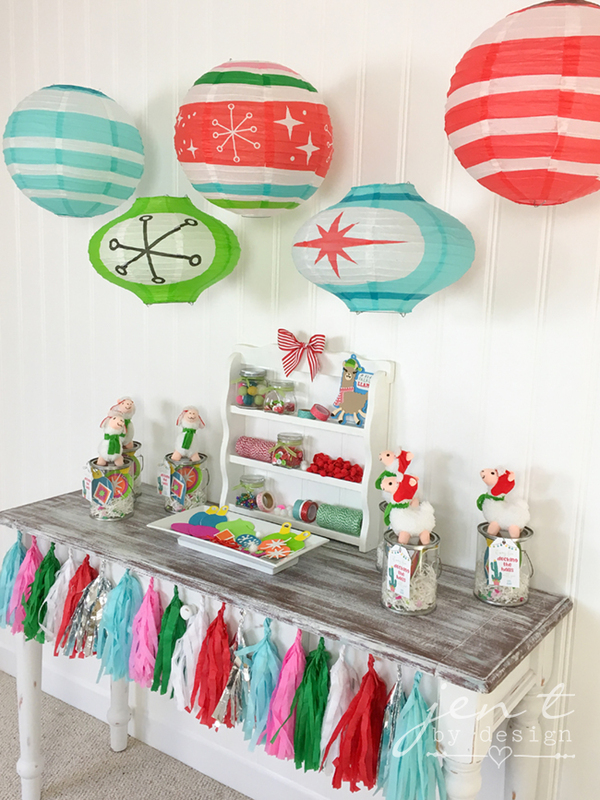 The Mod & Merry Ornament Hanging Paper Lanterns were the perfect decorations to jazz up the space and give it just the right pop of color, and the matching centerpiece was so cute in the center of our ornament decorating station! A tissue paper garland in coordinating colors finished off the display with just the right festive touch. If you don't want to invest a lot of money into the ornament supplies for this party, Oriental Trading is the way to go! These Llama Ornament Craft Kits are sold by the dozen, and are perfect for this theme! I also love the Bright Christmas Ornament Craft Kits that coordinate perfectly with the paper lanterns. 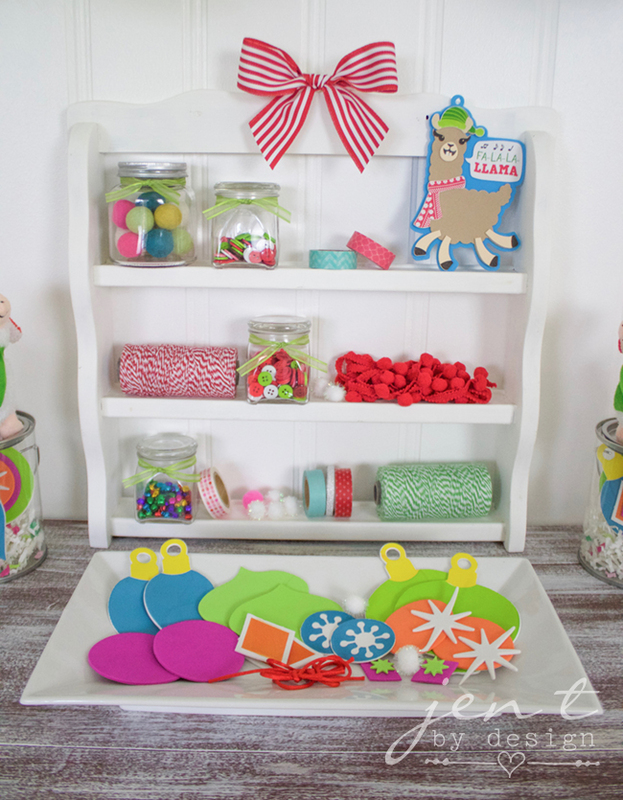 For decorating ornament balls, making garlands, and other holiday ornaments, we set up a little decorating supply station. I found an old spice rack at the thrift store, painted it white, and filled little jars with fun decorating supplies like buttons, mini bells, and felt balls. We also provided twine and ribbon to make ornament hangers. I wanted the kiddos to have something cute to take home their ornaments in, and these clear paint bucket containers were perfect! I designed a fun little ornament party favor tag to attach to each bucket, then topped each one with a plush little llama from Oriental Trading to tie into the theme. So fun!